It’s an interesting issue. Do we sometimes get too defensive about established science? In our efforts to counter the propaganda of the naysayers do we paint an over-optimistic picture of scientific knowledge? Do we sometimes neglect to make a critical analysis of accepted science while at the same time demanding this of the claims made by anti-science critics? Important questions – and don’t tell me they haven’t sometimes caused you to have some uncertainty when defending scientific knowledge from detractors. Of course, you are not alone in this. 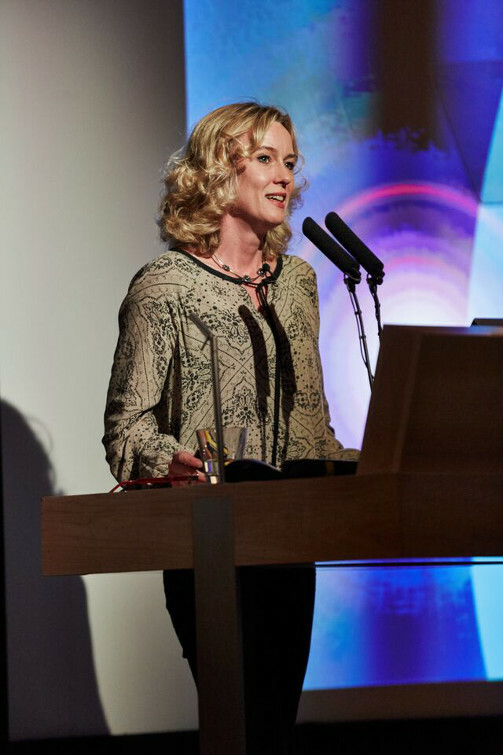 Tracey Brown, Director of Sense in Science, tackled the subject head on in the annual Sense About Science lecture last week. This was the title of her lecture. Perhaps it is a timely warning. We should not be defensive about scientific knowledge – or the policy decisions that rely on that knowledge. We should always be open-minded and critical. And we should always be realistic about the evidence. We should be ready to present and argue for the science – warts and all. Not hiding limitations and uncertainties. She made these points – and claimed that some of our social policies are based on insufficient information. Or that we sometimes exaggerate the amount and quality of information we have to support these policies. That is the “ugly truth” she highlighted in her lecture. Unfortunately though, her lecture was a practical example of another “ugly truth” – simple declarations are not enough. One’s criticisms of accepted knowledge are not necessarily correct or justified just because one is being critical. There is still the responsibility to base one’s criticism on facts – and to properly research the area before making critical claims. She based her criticism of at least one social health policy, community water fluoridation, on inadequate knowledge – claims from anti-fluoride campaigners she uncritically accepted. Readers can download a podcast of Tracey Brown’s lecture here. I will update this post with a video link when it is available. She discussed fluoridation from 15 – 19 minutes. The social health policy is based only on the original research which is over 70 years old and does not measure up to current scientific standards. Data shows that the oral health of both fluoridated and unfluoridated countries has improved over recent decades and this has more to do with the use fluoridated toothpaste and improved health care than CWF. These are, of course, two claims made again and again by anti-fluoride propagandists and campaigners. She could have taken her critique directly from one of Paul Connett’s political submissions to councils considering fluoridation. If she did so, she was irresponsible as there are plenty of experts who could have provided information of far better quality. I contacted Sense About Science and found out that Tracey used the following papers to “formulate” her comment on fluoride. Peckham, S. (2012). Slaying sacred cows: is it time to pull the plug on water fluoridation? Critical Public Health, 22(2), 159–177. Cheng, K. K., Chalmers, I., & Sheldon, T. a. (2007). Adding fluoride to water supplies. BMJ (Clinical Research Ed. ), 335(7622), 699–702. The first claim is just silly. Of course, decision makers use the information available at the time – 70 years ago they used the information that was available then. But fluoridation decisions have been made again and again over the years and it is perfectly natural that decision makers will use the current information for those decisions.The efficacy and safety of CWF have been investigated many times since it was first introduced. Science does not stop after a single study. If Brown had made a simple literature search she would have realised that (see Water fluoridation effective – new study for just one recent example – there are many others). Or, given that none of us have the time and expertise to be well informed about a wide variety of subjects, she could have consulted somebody with up-to-date knowledge and expertise on the subject. She certainly should not have relied solely on the very one-sided papers by Peckham (a well-known UK anti-fluoride activist) and Cheng et al. From the audio Brown appeared to use this graphic (below – left image) from Cheng et al., (2007) which is very similar to the one promoted by the anti-fluoride propagandist organisation Fluoride Action Network. 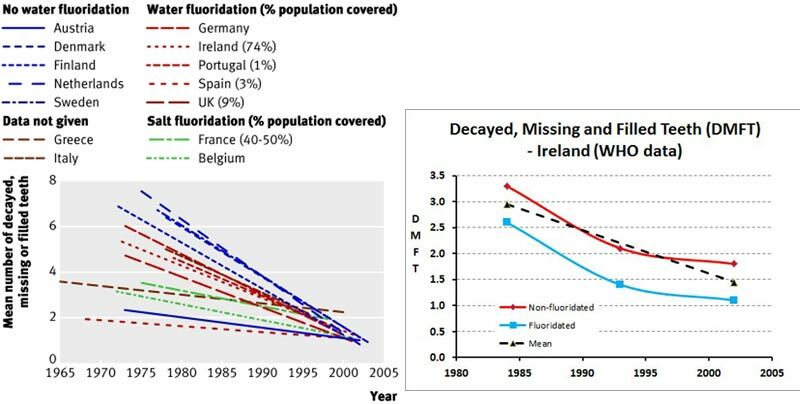 I have discussed this graphic in several articles and in my debate with Paul Connett (download the pdf) It is based on extremely limited WHO data (hence the straight lines), makes comparisons which ignore the multiple factors influencing oral health, and ignores the within-country data which show the efficacy of CWF (such as for Ireland in my second figure). Unfortunately, the “ugly truth” Tracey Brown demonstrated was that even scientists, and supporters of science, can be fooled by the claims of anti-science campaigners if they are too lazy to do their own checking. Perhaps she also demonstrated that even scientists, and pro-science people, can suffer from confirmation bias – just like anyone else. They can sometimes adopt a partisan position which restricts them to considering only the misinformation and distortions peddled by anti-science campaigners. But it does highlight a dilemma for people like Tracey Brown who might feel they have a “whistle-blower” mission to insist that science, or its practitioners, pull up their collective socks. (I hasten to add it is a “mission” I support – as I support “whistle-blowers” in general). The dilemma is that we, as individuals, can not be experts in everything. We are not capable, individually, of making a well-informed critical and objective judgement on all the issues we may have to face in preparing a lecture like Tracey’s. We have to be careful about relying on our own biases or poorly informed memories. We have to recognise our limitations and not be afraid to consult experts for clarification, updating knowledge or even just getting one’s head around complex issues. The debunking of many of the claims made by scientific naysayers is often like shooting fish in a barrel. It may not require much checking or even serious engagement with the subject. But it is irresponsible to transfer that lazy approach to serious consideration of real science or the social policies informed by that science. It is especially irresponsible when speaking as the head of a respected organisation and where listeners may feel justified in seeing the claims as expert and to be trusted. Again we face the fact that as listeners none of us can critically judge a speaker’s claims on all the subjects covered. In this example, I have sufficient knowledge about the science behind CWF to judge this aspect of Tracey’s lecture and see she was mistaken. But what about the other subjects she covered? For example, she claimed that current health advice on cholesterol relies on inadequate research and could be wrong. Do I take her word for it? I certainly don’t feel I should – if she is wrong about CWF she may be just as mistaken about cholesterol. That also makes me wonder if the Sense About Science organisation is as credible in its pronouncements as I used to think it was. Can you handle the truth? Some ugly facts in science and sensibility – an article by Tracey brown introducing her lecture. This entry was posted in Health and Medicine, politics, SciBlogs, science, Science and Society and tagged Annual Lecture, fluoridation, fluoride, SciBlogs, Sense About Science, Tracey Brown. Bookmark the permalink. Alas, I shouldn’t be surprised by this since one of Sense About Science’s luminaries has been Ben Goldacre who also attacked CWF. Greenbuzzer, far from denigrating anyone I have been in contact with Tracey and offered he equal space to pout her case if she thinks I have been unfair. Yes, lindarosarn, Ben made the same mistake. I notice he gives heavy reliance to the Cheng et al paper too. Unfortunately, despite several emails, Ben has not yet responded to queries about that article. I personally think he needs to be publicly confronted with his mistake. These sort of mistake destroy the credibility of people like Ben. The public have trouble knowing when to trust supposed scientific truth. How about you wait and see what Tracey Brown replies. Wow. An 11 year old reference from soundhill1 to a suit that was settled on the same day that it was reported. What a storm in a teacup. Stuartg, GSK would probably have known the development over several years of the work Spitzer was representing. He has probably been effective in hurrying them along. Though they say they are releasing trial data they are keeping a very tight rein on it. It is a moot point as to whether that aids patient safety or not. is harder to come by. Trust? With any science those who would be considered “pro-science” can do as just as much damage to science and the science as those from the anti science brigade. Fluoride in water is one such debate while Climate change is certainly another. So when defending or critiquing the science think to yourself are you being scientific and being reasonable to critique and new techniques or are you no better than a more fringe religious fundamentalist who is absolute stoic in their ways. Your response Ken highlights clearly just how blinkered, biased and closed minded your version of science is (and always will be). You obviously have not yet established the difference between research and confirmation studies. You provide no evidence, you use ad hominem and you clearly show you haven’t read Ken’s article. Not only is the irony is thick. Yes, Trev’s throwaway comment was typical of him – completely unsubstantiated and revealing his own ideologically-driven blinkered view of reality. However, I thought the said he had given up on me and was leaving this blog for good. Again, as I expected, more personal denigration from people who purport to be the experts on the science behind the decision to top-up the natural level of fluoride in raw water. I have yet to see from you people any reference to recent research that supports the safety and efficacy of adding hydrofluorosilicic acid to community water supplies. Even NZ health authorities, in response to OI requests, have stated they do not have any such information on that aspect of fluoridation. My view of reality is observationally driven and what I observe is that much of the science used to support CWF has been skewed by miss-representation, rigged research and downright deceit. The fluoridation issue has a history of vested interests buying the science needed to persuade the policy makers to make decisions that favour those vested interests. Science is not squeaky clean and I suggest that was what Tracy Brown was hitting on in her ‘ugly truth’ lecture. Good on her for blowing the whistle! A recent example of ugly truth is Coca Cola pouring millions of pounds into British scientific research to counter claims that its drinks contribute to obesity. Part of that scientific deception was setting up an apparently ‘independent’ European Hydration Institute that promoted the sort of sugar based hydration drinks the company sells. My observation of this and other such practices is that the science becomes compromised in the pursuit of making money. Where corporate money comes in the door principle based science sometimes goes out the window. This is not a criticism of all scientists but simply a recognition of the ugly truth that exists in todays market driven world. My withdrawal from this blog was mainly because I was caring for a close family member going through a bout of aggressive cancer and that has been my focus rather than wading through some of the crap you folk indulge in. Trev, you clearly have a reading problem because I often cover new research here. Also, you are surely aware of the recent review by the Royal Society and the Office of the PM’s Chief Science Advisor. That covers research up to date to the middle of 2014 and covers safety and efficacy thoroughly. But you can lead a horse to water . . . Yes, your mate’s OI request failed to get a list of papers “proving” fluorosilicic acid is safe. I suggest to him that he also put in a similar request for papers on the safety of water – he will find a similar response. There is no research that can prove any chemical species, fluorosilicic acid or water,”safe.” That determination is inferred from research investigating the toxic or other effects of the chemical, applying common sense about dose, concentration, etc. I challenge you to take up that suggestion and put in an OI request for water. I will interpret your refusal to do so as an acknowledgement of dishonesty on the part of you and your mate regarding such frivolous OI requests. Come to think of it, this has been explained to you many times. What are you – completely thick or just dishonest? Yes “miss-representation, rigged research and downright deceit” is a good description of the propaganda from the Connett crowd. Did you listen to Tracey’s lecture? No, probably not. You certainly didn’t understand it. Science being “squeaky clean” was not the subject (no one ever asserts science is in the real world) The issue Tracey was promoting is that sometimes decision makers and advocates make over-optimistic claims about the research. It is a point I continually harp on here. People making claims should actually go back to see what the research says and then interpret the evidence critically and intelligently. My criticism of Tracey’ lecture is that she did not do that in her preparation for the lecture. still, Tracey has responded to my offer for space here to discuss this and I hope that issue will be clarified by our discussion. The misleading “scientific” claims of Connett’s crowd are indeed a glaring example of how such claim can be driven by big business interests (the fact he is funded by Mercola is an obvious example – as is the funding of high court action here by the NZ Health Trust – the lobby group for the NZ ‘natural”/alternative health industry. I sympathise with your plight in caring for a close family member at the moment. It certainly mirrors my situation over the last 6 years almost exactly. I often give up an “atheist prayer” for the fact that science and evidence based medicine and health procedure has kept her alive as long as it has. But please don’t allow that personal situation to colour your attack on science here.